Stay tuned for information on Indivisible phone-bank sessions (at home and group sessions) to help stop this bill! The GOP is gaining momentum on a last-ditch effort to repeal the Affordable Care Act before the September 30 deadline with a new Senate bill. The Graham-Cassidy bill is strikingly similar to earlier Trumpcare bills. While we have not seen final details, we know it still destroys Medicaid as we know it by fundamentally and permanently transforming the program into a per-capita cap. The bill also still undermines protections for people with pre-existing conditions and people who need treatment for opioid abuse by allowing states to waive essential health benefits. Learn more about this harmful bill. We must keep the pressure on our Senators to vote “no” on this dangerous bill. Call Senator Durbin | DC: 202-224-2152 | Chicago 312-353-4952"
Script: Hi, my name is ______ and my zip code is _____. I'm a member of Indivisible Chicago. I'm calling to ask the Senator to oppose the Graham-Cassidy Act, which is essentially TrumpCare 3.0. It still destroys Medicaid as we know it by fundamentally and permanently transforming the program into a per-capita cap. The bill also still undermines protections for people with pre-existing conditions and people who need treatment for opioid abuse by allowing states to waive essential health benefits. The GOP is counting on sneaking this bill past the American people before September 30. 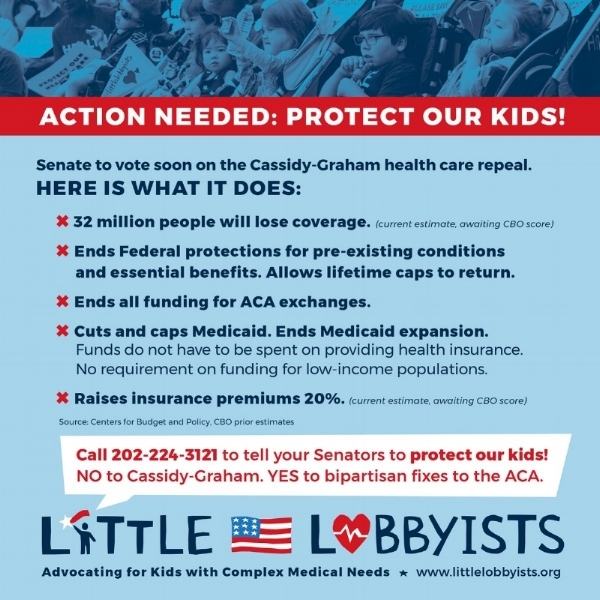 It’s important that we get the word out that Graham-Cassady is a dangerous bill that will devastate Medicaid and remove important protections enshrined in the ACA. Please help us get the word out on social media, especially if you can urge your swing state friends to pick up the phone and call their senators. We’ve stopped Trumpcare before, and we can do it again, but we need your help! Share this infographic to help get the word out. We are working with other groups to set up phone-bank sessions to stop Trumpcare 3.0, so stay tuned for more information!